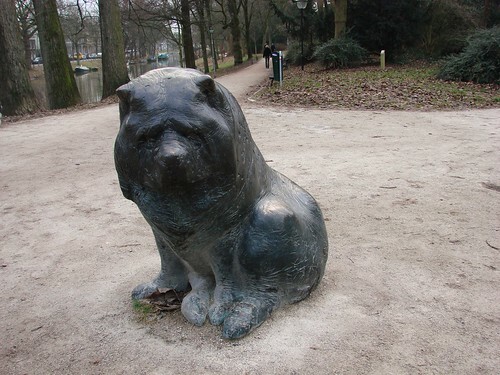 This entry was posted in arts, photos, Utrecht Daily Photo and tagged artist, arts, Biru, chow chow, dog, Joop Hekman, links, photos, Rietveld, sculpture, Servaasbrug, Stadsschouwburg, Utrecht, Utrecht Daily Photo by Alison. Bookmark the permalink. I’m a bit scared of dogs, but aw I want to pat this one! With a big dog of my own, I particularly like this furry (gender-unknown) friend. It’s quite big, coming up around mid-thigh on me (and I’m 172 cm). I’ve actually been wondering about this statue. (But was too lazy to look it up.) Chows don’t seem to be a common breed here, so I was wondering if it had any special significance. Thanks for sharing! I’m surprised it took me this long to look it up, since I’ve also been curious about it. It reminds me of a similar statue dedicated to a police chow in Japan, I think. I thought this looked familiar – I ‘ve seen the one in Enschede long time ago. Great to see that the Rietveld “ramifications” are endless…. It seems like every time I look something up, Rietveld pops up somehow! It’s fascinating to realize how widespread his influence was in some ways. Oh, thanks for the link to the Enschede grouping! I was curious about the rest of it, but hadn’t gotten around to searching for it.